Tired and a little sore..but good! SO I did the first round of exercises that I found on Livestrong.com last night. I was very careful…did only a handful of each (3-5). There were 5 exercises attempted. One of the funnier things happened at the start..getting to the ground in the first place. I stood there for a second remembering my falling flat into bed experience from just a few days ago and decided my plan of attack. My girls were by my side to “help” but I thought I would squash them if something were to go wrong so I told them to stand clear. I was very proud of myself..got to my knees, turned carefully to my bottom then basically to my side to lay flat on my back. Once down I thought “well that’s enough for today :-)”. But I pushed on. It is something when you realize lifting a stick over your head or just stretching your elbows to the floor would be difficult. The girls cheered me on and I felt great afterward to finally feel like we were moving forward! Getting up from the floor was another thing all together. Since I have no core strength I am basically stuck on my back. When I was finished Madison says “I will call daddy”. NO! I can do this! So when Frank placed the bed into the family room, he tied these workout straps to the frame thinking that they would help me get in and out. They never worked..they had too much give. 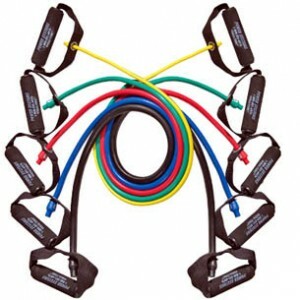 As I laid there stuck on my family room floor, I remembered the straps…”Madison, hand mommy the green cord..please” . It was something of pure heroic maneuvering (alright maybe not but I was dam proud of myself!) I was able to pull myself to my side and closer to the end of the bed which I could then use to get up..I was on my feet! The girls ran and told their father as if what they had just witnessed was something of pure fairy tale…I think they are proud of me :-). The tired (I assume) comes from my medicine changes. I have been working to get away from the Oxy for several days but was still taking one an hour or so before bed. Last night I went with a vicodine after my “workout” but went to be pretty clear..and laid there, tossed, turned. Then I had a pain (which I have had on the left side between my breasts). I pointed it out to the doctor who says it is normal is the connection point for the flap and not to push on it. First response was to grab a pill. Instead I took a motrin and put an ice pack on my chest. Eventually I dozed for a little while but running on just a few hours. I know it will work itself out and is part of the process. On the agenda today, more exercise and maybe, just maybe our first venture out in the car. We will see how the day unfolds. Next postWatch out here we come! Vicodin makes me sleepy. Watch out for the ice – it is hard to know when you’ve had enough due to lack of sensation. Good for you for getting off that floor! LOL..I felt like a big hero getting off that floor! I will watch, would like to be totally narcotic free very soon. Sad part about that is I will get there and then head back in for the next procedure. Good luck if you get into the car today! I had a hard time with my seat belt while my range of motion was still working its way back. Nothing that your girls couldn’t help you with I’m sure. Best of luck and keep up the good work! We went out! I could get the seat belt on fine but it rubs. I was happy to be out but honestly just as happy to get home!